Mama, Coach's wife, Teacher of middle schoolers. I value moments and believe that the small things really are the BIG things. My thoughts run deep. Life is a mess- a cozy, uncomfortable mess. But it's mine, and only I can make it happy. Peace is Quiet. Quiet is Peace. Built by my pappaw, my daddy, and my uncle John in the late 70’s, early 80’s (I’m sure others helped…but these are the three closest to me). On the steps there and in the grout between the logs are carvings: family members’ names and dates, handprints, and a quote. Oh, and if those walls could talk. The narrative within them would be a best-seller. No doubt. I haven’t been there in a few years. My cousin has taken care of it…just the way pap would’ve. And for that, I am grateful. Regardless of the time I’ve spent away from it, I can still smell the flowers my mammaw planted there. I can feel the dew that blanketed everything as far as the eye could see. I can hear the creek water running through the front yard and the sound the porch swing made carrying us back and forth, back and forth. I can still remember the tiniest of moments spent there: waking up early before anyone else and going out to the porch to find my pappaw sitting in silence waiting on the deer to saunter by, playing all day long in the freezing cold spring water in summertime, walking the road in front of it with my mammaw and aunt looking for flowers we’d never seen before, working puzzles in the living room by the dim light of a kerosene lamp, eating ice cold watermelon on the front porch that we’d chilled in the spring up the driveway. I swear I thought watermelons grew in water until I was 12. I remember the day I asked mammaw where the watermelons were that used to grow in the spring. She told me, “Lord, watermelons didn’t grow there; we put them there to keep them cold.” Oh! Okay. Lesson learned, mammaw. Aside from the watermelons, I can still remember the way the sun would shine through the leaves of the trees creating stenciled rays of light on the ground. The sound of the cicadas and crickets at night…It will always be the most peaceful place I have ever been. I feel certain the love I have for camping and nature all started at the cabin. Me, mammaw, and my aunt walking the driveway at the cabin. 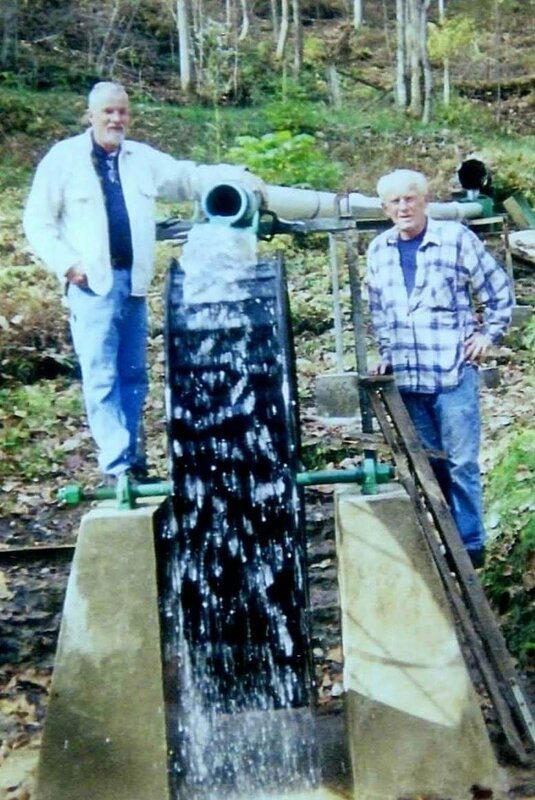 My pap put in a handmade water wheel that he used to start the plumbing to the house. He, my daddy, my uncle, and a good friend carried it out of a “holler” in Grainger County. All 400 pounds of it. And oh how I wish I had been in on that trip! Oh, the colorful language that spilled across that holler. I didn’t know this until my uncle told me. I thought pap had built it from scratch, but in reality, pap had just “perfected” it. That was his way. I remember him working countless numbers of hours to get it right. Failure after failure, day after day…until finally, it worked the way he wanted it to. I’d sit there watching him go through trial and error, and he’d say, “Mandy, I just don’t know why it won’t do what I want it to do.” I’d nod, but I knew he’d get it right. And he did. It’s still there, turning and working even when no one is there to watch it. I remember it being so dark you couldn’t see your hand in front of your face. The only light glowing was from that of old metal lanterns and candles…or the stars. It had a wood stove that in the winter months needed stoking every few hours. And my pap would tend it, tirelessly, in the silence of the night. I also remember him telling my mammaw to “slow down” when she’d fuss at him for letting us use his .22 to shoot cans off a log in the front yard. She’d just say “Well…it’s dangerous” and give him a huff and grumble on her way back into the kitchen. I’m not sure if she really wanted him to stop or if she just felt like he needed to be fussed at. We did a lot with pap that mammaw disapproved of. However, mammaw always had her way of helping us get into mischief too… and she joined in our fun. If she wasn’t being the audience of my one-woman show, complete with my hairbrush microphone…she was rubbing me down with butter and laying out in the sun with me. All on the back porch of that little cabin. She sure did love the sun and water. I remember the grandkids begging her to get in the water with us, and she eventually would. But she’d first respond with something like, “Let me smoke this cigarette first.” And after about half a pack, she’d get in. We would sometimes hide them from her, but she’d pull out another pack and just smile. She had a sneaky side that she was quite proud of. And I remember pappaw having an endless amount of quarters handy to give the grandkids for every deer spotted and that jar in the antique cabinet that held a rattlesnake’s tail. He had killed it for mammaw…because that woman was terrified of snakes. We couldn’t even play with rubber ones within a mile’s radius of her. But he kept the tail as a trophy. That was his way. He was proud. Me and pappaw at the cabin. Upstairs were two bedrooms that mammaw kept “critter free” with a sprinkling of mothballs. The sheets smelled of Gain detergent and Downy, the April Fresh scent. I still wash our clothes in the same combination. Nothing else will do. It’s what mammaw used, and it reminds me of her. There were quilts, old colored glass lamps, rag rugs, and pillows so fluffy that they were almost too soft. Outside the bedrooms was a long walkway with one railing that was put together in a way that reminded me of the fences we’d pass on the ride there. And a stuffed fox. Another trophy of pap’s. I was always confused about why he put it upstairs out of sight, but as I got older, I knew it was to scare us kids or any new people we brought up to the cabin. The floor was creaky and when mammaw would sweep it, dust would fly off into the living room below. But, that gave her a reason to go downstairs and dust. She was hell-bent on keeping a clean living space. And the steps…The steps were the steepest I’d ever seen. I would almost bet money that the measurements were slightly off- the result of pappaw winning an argument between him and daddy. Daddy was a meticulous carpenter, measuring everything twice…but if pap thought daddy was “not doing it right”, he’d measure it himself once and just take the job over. Daddy would let him because he wasn’t much of an arguer. And that was his way. And I love that about him. Pappaw must’ve won the battle over those stairs though. One misstep and you’d miss the platform of the step below and land hard on your behind at the bottom. Trust me. We’ve all done it. That’s why mammaw would always tell us to “be careful on those stairs” and “watch the steps” no matter how old we got. And even though we knew, it was nice to hear her say it. Me and mammaw looking out the window at the top of the stairs. We would spend weeks there in the summer, weekends the rest of the year, and had countless numbers of family get togethers over the years. My sister even got married there. An event that I know my mammaw and pappaw had hoped for since the first tree was cut down. I bet they talked about it when us grandkids weren’t there with them. I bet they looked out from the front porch, coffee and cigarette in hand, imagining one of us getting married “over by the creek”. Even though they took us kids a lot. They went there together every chance they got. It was quiet. It was peaceful. It was a sanctuary for them that reminded them of “the good ole days”. I imagine they would sometimes go hours and not speak a word to each other in the stillness of that property, and that didn’t bother them one bit. I like to think that silence kept them “crazy” and became an important part of the soundtrack of their lives. Every now and then pap would probably yell up to the cabin for mammaw to find his lighter or his glasses, and mammaw would holler out “Pap, you want a bologna sandwich and a coke?” They’d reconvene on that porch and “have a bite to eat”, talk about their kids and grandkids, and fuss at each other over little things. And sprinkled into their conversation were, more than likely, long pauses of quiet. That was their way. It was crazy or it was quiet. But at the cabin, it was mostly quiet. The quote etched into the outside wall of the cabin didn’t make much sense to me for years. I would read it over and over. Slowly. Trying to understand it. Repeating it to myself out loud until I’d just walk away and continue what I was doing like hadn’t just spent the last 30 minutes analyzing it. I don’t think pap put it there to confuse me. I don’t think he put it there thinking just anybody would understand it’s meaning either. He did put it there because he believed it. He did put it there to make us think. He did put it there because it reflected the time he spent there, year after year, season after season with the people he loved. And in the time that has passed since he and my mammaw left us here, I have started to appreciate it’s meaning. There is value in quiet; there is an overwhelming sense of satisfaction in finding peace. For pap, peace and quiet brought him joy. In peace and quiet is where he found himself and figured out who he was. Looking back, it all makes sense to me now. He would hunt every chance he got. He wouldn’t always bring home a deer, but I don’t think he always went to bring home meat. In fact, my mammaw wouldn’t even let him cook it in her kitchen when she was around. I bet he went sometimes just to listen to the quiet. To collect his thoughts. I bet he would get in his tree stand, take an intentional deep breath in every now and then, and spend time watching with patience every movement around him. I bet sometimes he’d even fall asleep. 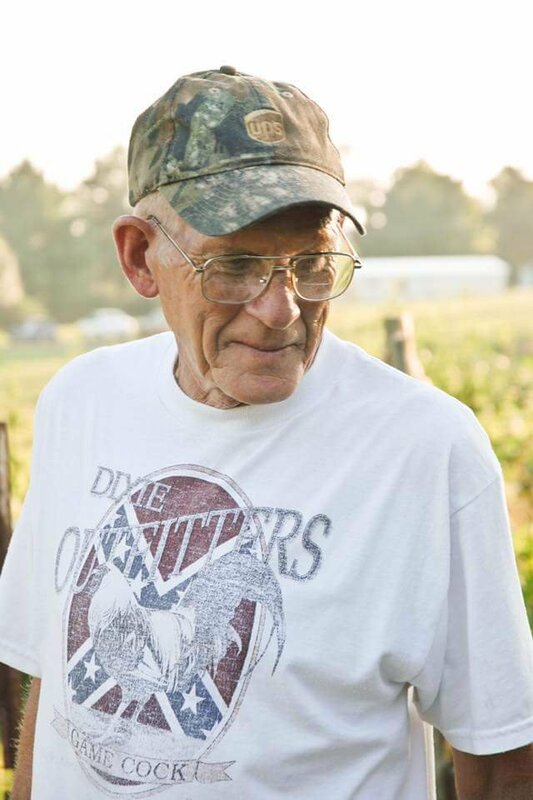 When we were growing up, one of the first things we’d ask mammaw when we walked into her house was “Where’s pappaw?” She’d say, “He’s outside” or “He’s in the shop”. Regardless of where he was, I bet it was quiet. And we didn’t mind it. We didn’t have to have him in sight. Just knowing he was nearby made us happy. However, we did want mammaw in sight. She was the one we’d sit with. Have coffee with. Gossip with. She cooked for us, checked on us, gave us crazy things to do, and rocked us to sleep in her bed while telling us the story of The Three Little Bears. She had her way too. Me, mammaw and pap on their back porch. Right now I’m reading Hillbilly Elegy by J.D. Vance. And it has moved me, to say the least. I have laughed out loud. I have cried. I have connected. I can’t help but feel pride in the bit of “hillbilly” in my blood. While some have found the book to be outrageous and far-fetched, I have found some comfort in it’s pages. Some of us inherited a little more crazy than others, and I attribute a lot of my crazy to my amazing parents, grandparents, and family. May I take pieces of each of them throughout my life. I thank all of them for raising me exactly as they did. It wasn’t always safe. It wasn’t always “right”…but it turned out so good. And when pap carved that quote into the outside wall of the cabin he was so proud of, I think he was leaving something for us that meant something: Sometimes it’s just best to find peace in the quiet…And while he left it in his most favorite place in the world, he meant for us to live it everywhere we go. Thank you, pappaw. I understand now. Thank you! I love you more than I could ever say. One day I will post about spending the night with you until I was in college, and how you so profoundly impacted my life. You started saving me when I had tummy aches in daycare, and you have never stopped. I’ll never be too old to be your “baby”. Miss you! Goodnight. Love you lots! And remember, I am here. I am always here. 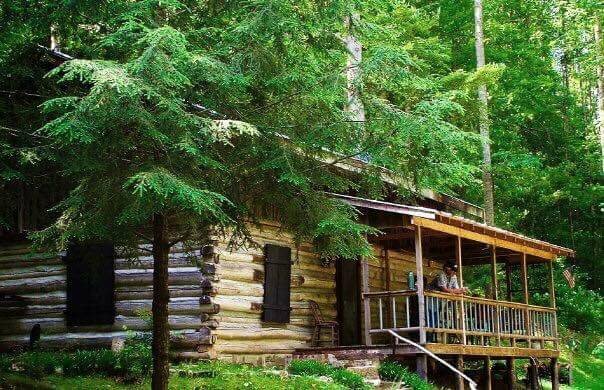 Beautiful cabin, beautiful words. Loved it!